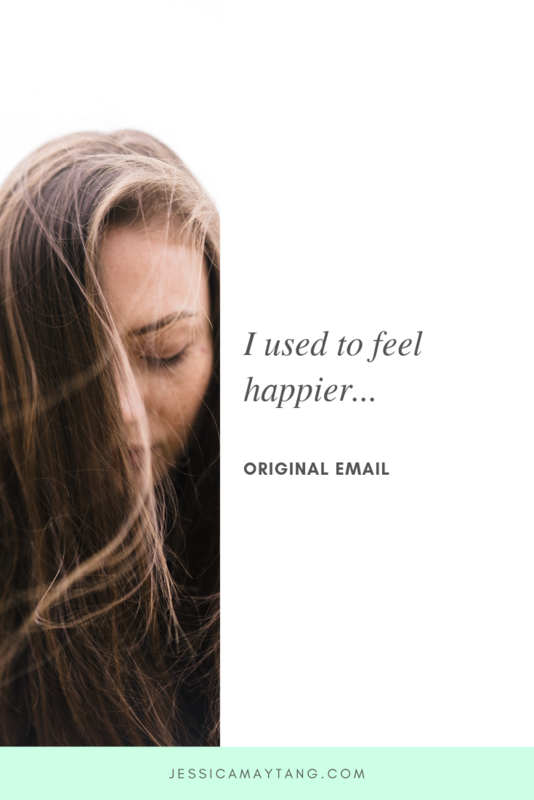 "I used to feel happier..."
*First published via email on Monday, March 11, 2019. Click here to subscribe. Have you ever felt grateful for a thank you? I feel that way every time my clients thank me. I used to say, "No, thank YOU," but realized that I was saying that as a way to deflect. I wasn't owning my gift. I wasn't being fully present and accepting their thanks. It's the "humble and polite" thing to do, right? Especially for us girls. Since I talk all the time about owning who I am, which includes owning my gifts, I now practice receiving thanks with love, gratitude, and openness. And what I've learned is that you can receive while still being humble. You can own who you are while still being humble. And polite. It's the energy behind the words and actions that count. My clients lately have been so aligned with me and my strengths that I'm saying "Thank you, Universe, more please!" every day. I feel like I am getting to work with my people. Where they are when they come to work with me is where I used to be, and so I can say with full honesty and enthusiasm that they ARE going to experience the transformation they want. As I sat down to record my next batch of podcast episodes, I felt called to honor my clients by sharing the most common concerns I hear about and the transformations I get to witness when we work together. This week on the podcast, I shared how most of my clients come to me saying something like, "I feel like I used to be happier. I used to be more carefree, more joyful, and now I feel like I'm just down on myself all the time. I have friends, but I feel like I can't really talk to them about this stuff either. I don't know what's wrong. Can you help me?" Ohhh I can't tell you how excited I feel when I hear this! Because I can see how their life is going to transform when they figure out what is creating those patterns of self-deprecating thoughts. Their relationships and friendships will change, their career will change, their productivity will change, their feeling of connection with other people will change, and most importantly, they're going to get a deeper understanding and build a deeper friendship with themselves. So on the podcast, you'll also learn a couple tips to help you move through "the funk" if this is what you're struggling with in your life. For those of you who have been receiving my emails, I went through a big funk in the beginning of the year, too. And I got through to the other side, which means you can too.